Refer to Regulation 10 of Building Control (Buildability and Productivity) Regulations 2011], it is a mandatory requirement for builders to submit construction productivity data to BCA from 15 July 2011. This requirement is applicable to all projects with GFA of more than 5000m², including new building projects, and upgrading and A&A projects. The aim of the ePSS is to help builders monitor their projects’ manpower usage and allows them to submit the manpower usage and productivity data to BCA on a monthly basis. From the data collected, BCA can calculate the industry average project productivity for the different building categories. 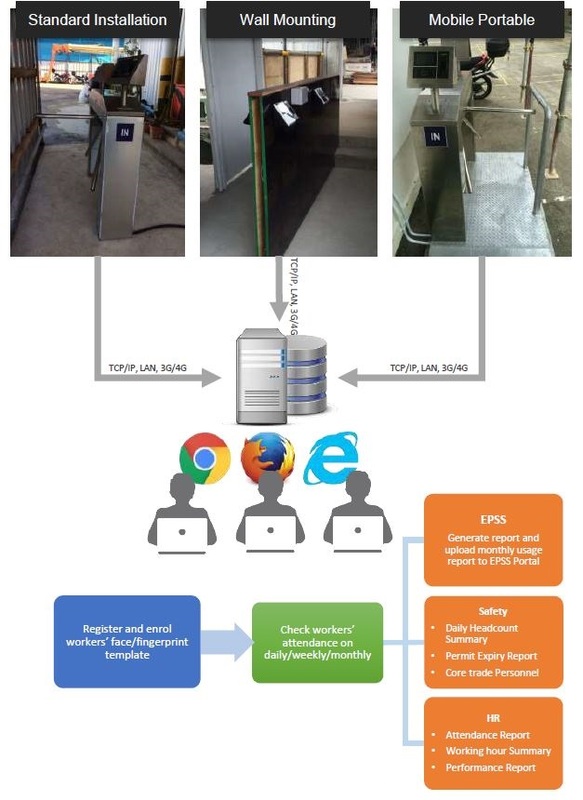 Biometric Authentication System Solution (BAS) To enhance the reliability and efficiency in the collection of Construction Productivity Data, builders need to install and operate the BAS for building works with Gross Floor Area (GFA) of 5000 m2 or more submitted for Planning Permission on or after 1 November 2014. – Biometric Readers locate at worksite entrance and exit point for the purpose of electronically monitoring and tracking the manpower usage throughout the contract duration. – Fast and secure sensor that accurately captures and authenticates distinguishing physiological traits. At each controlled access location, the system shall be able to achieve a maximum clearance time of 1 minute for every 10 persons. – Provision to guide the flow of workers (e.g. turnstiles and railings). – A real time monitoring and recording device installed at each controlled access point to prevent any fraudulent attempt by the site personnel. – Suitable measure(s) (e.g. backup battery supply etc.) such that the integrity of the manpower monitoring data is not affected during power outage. – Generate raw data or output in the required format which shall include employee name, date, clock in time, clock out time, tabulation on the number of hours at site. More Turnstiles, Half Height and Full Height. Following EPSS sample for your reference.